I’ll never forget popcorn night as a child as the tiny kernels would magically transform into white fluffy goodness. As an adult a fantastic friend, who happened to be my boss at the time would make popcorn at work as a much needed respite to the day. She single handedly rekindled my love of popcorn. Let me make this clear, the stuff that comes in a little bag, and is stained with food coloring is not popcorn. Not even close. Popcorn is a whole grain too, and when you make it from scratch you can control what is put on it. The closer you are to the source of your food the better! Looking for more snack ideas? Look no further! Over medium heat place the olive oil in a large sauce pan, that has a tight fitting lid (glass lid preferably). To the oil add 3 kernels of corn. 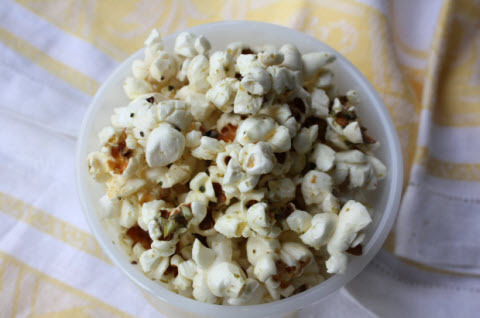 Now sit back, relax and listen for those kernels to pop to perfection. When you hear one pop add the rest of the popcorn. As the kernels begin to do their thing, shake occasionally to prevent burning. You will know the popcorn is done when the pops have all but stopped. In the meantime mix the butter, garlic, and jalapeño powder in a small bowl. When the popcorn is done, transfer it to a large enough bowl to hold all the popcorn goodness, and then drizzle the butter mixture over your popcorn. Eat quickly before someone else does.